Orthopedic costs account for nearly 30% of your overall healthcare spend annually. Regenexx can help you reduce that by more than 80%. That’s why National Insurance Services has partnered with Regenexx. 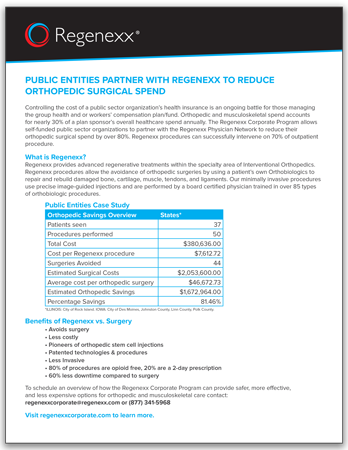 Available to self-funded, public sector employers with 200+ employees or more, Regenexx helps employers reduce costs, improve outcomes, and deliver better satisfaction to their employees for orthopedic care. Due to the latest in medical technology, surgery is no longer an employee’s most predominant option to alleviate pain or fix injury. Regenexx helps employers reduce their orthopedic claims by providing employees with safer, more effective, and less expensive procedures.